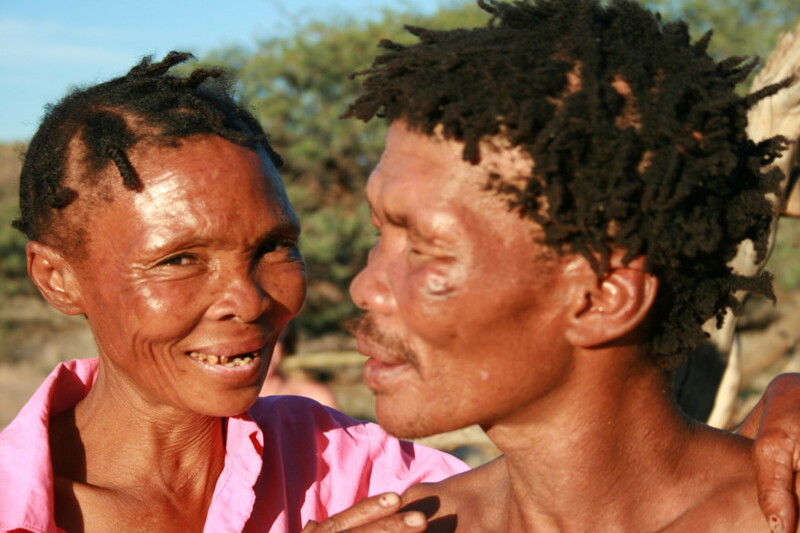 Dawid Kruiper, the recently deceased leader of the ǂKhomani San, led his people through a land claim settlement that saw the restoration of a section of the Kgalagadi Transfrontier Park to his community. He believed that many of the social ills that plague the ǂKhomani San today stem from the loss of their traditional culture and identity. Dawid Kruiper’s dream was to establish a traditional village as a “Veldskool” (Field School) in the Kgalagadi Transfrontier Park. His dream has been realized since his death by community members who have constructed the traditional village called !Gam !Gaub from natural materials. Meaning “Renewal of Old Traditions,” it overlooks Twee Indabas Pan, an important site to the Bushmen in the Kgalagadi Transfrontier Park. At !Gam !Gaub, young community members will learn to live side by side with nature, and to understand the medicinal properties of the plants. They will learn not to fear the predators of the Kgalagadi, and to hunt traditionally. Their elders will teach them their language, stories, dances and crafting skills. They will learn to respect and protect nature as their ancestors did in centuries past. Visitors and students will be able to join the ǂKhomani San students at !Gam !Gaub, learning rudimentary skills and experiencing the natural rhythms of this ancient culture. The tourists will provide a source of revenue to !Gam !Gaub, and the ǂKhomani San students will be able to practice their newly learned skills, as they share their knowledge with the visitors.